Twisted Tubular Herringbone Stitch is a variation of regular Tubular Herringbone. This bead-weaving stitch adds a gentle spiral effect to the beadwork that is not present in the normal version. And, how to connect the ends for a seamless finished look. 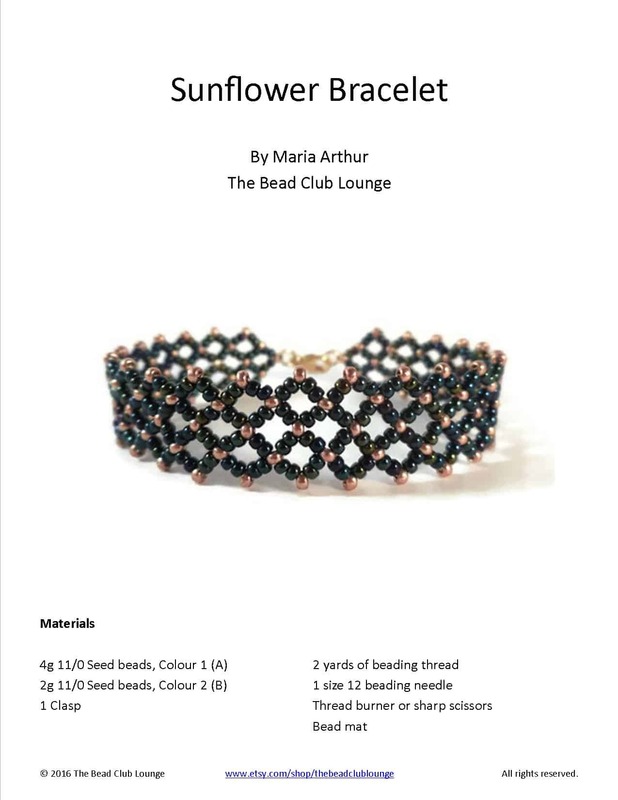 This beading tutorial is recommended for Intermediate skill levels as it builds upon knowledge of Tubular Herringbone Stitch. For your convenience, there is a materials list below with links to the supplies required for this project. I have made both a video and a written tutorial for the Twisted Tubular Herringbone bangle pattern. Here is the full written tutorial. Leaving a 4-inch tail, create a row of Ladder Stitch that is one column high using 2A, 2B and 2C. If you are not familiar with Ladder Stitch, see this post. Step 3: Go through the last 1C from the side opposite the tail. Note: Your beads will form a circle. Your working thread should be pointing away from the tail so you can add to the beadwork. Step 5: We will begin with regular Tubular Herringbone Stitch. String 2A and pass through the following 1A. Note: The beads will form a V-shape characteristic of Herringbone Stitch. Step 6: Pass through the next 1B from the tail end. Step 7: String 2B and go through 1B in the next column. Step 8: Pass through the following 1C from the tail end. Step 9: String 2C and go through the 1C in the next column. Step 10: Step up through the 2A in the next column. Step 11: Now, we will begin Twisted Tubular Herringbone Stitch. String 2A and pass through the 2A in the following column. Step 12: Pass through the top 1B in the following column. Step 13: String 2B and go through the 2B in the next column. Step 14: Pass through the top 1C in the next column. Step 15: String 2C and pass through the 2C in the following column. Step 16: Step up by passing through the top 2A in the next column. Step 17: String 2A and go through the next top 2A. Step 18: Pass through the top 1B in the next column. Step 19: String 2B and go through the top 2B in the following column. Step 20: Go through the following top 1C. Step 21: String 2C and go through the next top 2C. Step 22: Step up by passing through the top 2A in the following column. Step 23: Repeat Steps 17-22 until you have reached your desired length. Weave the tail thread into the beadwork, tie several half-hitch knots and remove the excess. Step 24: To join the ends of your bangle, line up the columns so the colours match exactly. With your working thread exiting the top A in one column at the end of the beadwork, pass through the top 1A in the corresponding column at the start of your beadwork. Step 25: Pass through the 1A in the adjacent column at the beginning of the beadwork. Step 26: Go through 2A in the corresponding column at the end of the beadwork. Step 27: Still working at the end of the beadwork, pass through the top 1B in the adjacent column. Step 28: Go over to the starting end of your beadwork and pass through 1B in the corresponding column. Step 29: Pass through the 1B in the adjacent column at the start of the beadwork. Then, continue through the top 2B at the other end. Step 30: Go through the top 1C in the adjacent column at the end of the beadwork. Go over to the start of the beadwork and pass through the top 1C in the corresponding column. Step 31: Go through the 1C adjacent to the column you are exiting. Then, pass through the top 2C on the other end of the beadwork. Step 32: To finish the connection of the two ends, pass through the top 1A in the adjacent column. Then, pass through the top 1A in the corresponding column at the start of the beadwork. Step 33: Reinforce the connection between the two ends of the beadwork to make sure it is strong and secure. Weave the thread into the beadwork, tie several half-hitch knots and remove the excess. Your bangle is now complete! Enjoyed this Twisted Tubular Herringbone Bracelet tutorial? Then, you will love this Twist and Turn Bracelet pattern! If you liked this tutorial, please ​​​​share it!